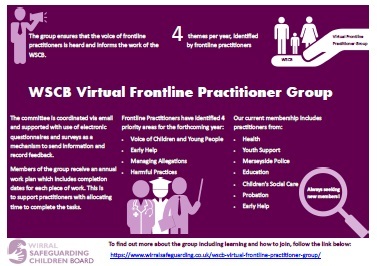 The WSCB Virtual Frontline Practitioner Group ensures that the voice of frontline practitioners is heard and informs the work of the WSCB. The group is made up of multi-agency professionals from various organisation’s and job roles who undertake 4 thematic pieces of work each year. How is the group coordinated? The committee is coordinated via email and supported with use of Survey Monkey and/or electronic questionnaires as a mechanism to send information and record feedback. Members of the group receive an annual work plan which includes completion dates for each piece of work. This is to support practitioners with allocating time to complete the tasks. 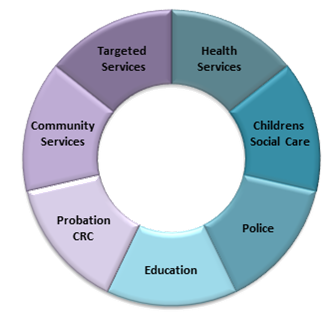 Themes are identified by learning from case reviews, multi-agency audits and consultation with frontline practitioners. The full timetable is embedded below. Throughout 2018, this page will include key findings and learning from the work undertaken by the group. 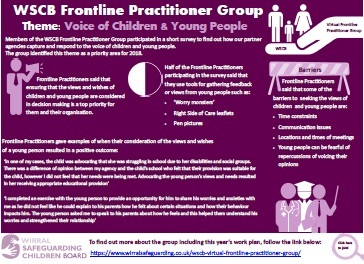 If you are a frontline practitioner and you are interested in joining the group or would like to find out more, please e-mail Kat Ryan, WSCB Quality Auditor.